Location: Located in the middle of Zhejiang Province, Jinhua is neighbor to Hangzhou, Shaoxing, Lishui, Taizhou and Quzhou. History: In the Spring and Autumn Period (770BC-476), Jinhua belonged to Yue State. Dongyang Shire was set up in the Three Kingdoms Period when Jinhua firstly appeared in the history as a county. In 1360, it was named as 'Jinhua'. In 1949, Jinhua was liberated and became the eighth administrative area of Zhejiang. In 1985, Jinhua turned into a prefecture-level city from a county-level one. It was not until 2004 when the present administrative division formed. Physical Features: Encircled with mountains in three directions, Jinhua's most areas are hills and basins. The main feature is high in north and south while low in the middle. Climatic Features: Jinhua belongs to the subtropical monsoon climate zone. Four seasons are distinctive there. Spring is warm; summer is hot and dry; autumn is cool and humid; winter is cold and dry. The annual average temperature is about 17.52C (63.52F). The coldest month is January while the hottest is July or August. When to Go: October is a colorful month with various festivals including China Yiwu International Commodities Show, Jinhua International Huangdaxian (a Taoist figure in China) Tourism Festival, China Orchids Festival and Jinhua Bullfight. Moreover, October has the most pleasant climate of a whole year. Local Highlights: Jinhua is a famous national historical and cultural city. Wu culture was once an important sector of the Confucianism in the history. Its 400-year Wu Ju (Jinhua Local Opera) is the second most important operas of Zhejiang. Many Chinese elites in literature, political and business fields were born there. Yiwu, the county-level city of Jinhua, has China's largest commodity market-China Commodities City, which are famous in the international market for its strong competitive power. Jinhua is a beautiful city as well. 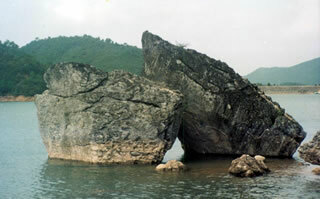 Double Dragon National Scenic Area is the most famous one through out the country. Double Dragon Scenic Area: Located in the north of Jinhua, this area is famous for the karst cave 'Double Dragon Cave', Taoism culture and mountain forests scenery. Duke Shi's Palace of the Taiping Heavenly Kingdom (1851-1864): Located in the east of Jinhua, it is a palace of the Duke Li Shixian of Taiping Heavenly Kingdom, which was established in the late Qing Dynasty (1644-1911) by rebellious farmers. This palace is the largest and best kept architectural relic of that period, with countless mural paintings, carving and other precious art crafts. Hengdian Movie City: Located about 36 kms (22 miles) away from Yiwu, it is the largest movie base in Asia and honored as 'China's Hollywood' in the world. The seven areas show the scenic or cultural sceneries from West Zhou Dynasty (11th century BC-771BC) to present. No.1 Family in South China: Located in north of Pujiang, it is a well kept house of Zhen's family. The harmonious family last from Southern Song Dynasty (1127-1279) to milled Ming Dynasty (1368-1644) for about 360 years. It fully illustrates the Chinese traditional family culture.